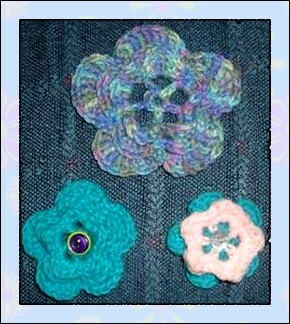 Here’s a handy crochet pattern with directions to make three different flowers from one pattern. With a little creativity, you could adapt the pattern to make more variations as well. Use one or two flowers to adorn a hat or shopping bag or make a fridgie or pin. Add wire or chenille stems and you could even crochet an entire bouquet of pretty blooms! Round 2- Sl st into first petal, ch 1, (sc, hdc, 3dc, hdc, sc) in each petal; join with sl st in beg sc. Round 3- Ch 6 (counts as sc, ch 5), (bpsc around dc from rnd 1, ch 5) 4 times; join with sl st in 1st ch of beg ch7. Round 4- Sl st into first petal, ch 1, (sc, hdc, 5dc, hdc, sc) in each petal; join with sl st in beg sc. Round 5- Ch 8 (counts as sc, ch 7), (bpsc around sc from rnd 3, ch 7) 4 times; join with sl st in 1st ch of beg ch8. Start as in Large Flower, work through round 4 Inner Rounds Attach yarn with sl st around post of any dc from rnd 1. Round 1- Ch 3 (counts as sc, ch 2), (sc around post of next dc, ch 2) 4 times; join with sl st in first ch of beg ch3. Round 2- Sl st into 1st petal, ch 1, (sc, hdc, dc, hdc, sc) in each petal; join with sl st in beg sc. Fasten off, weave in ends. Licensed under a Creative Commons Attribution-Noncommercial-No Derivative Works 3.0 United States License. Provided by Nikki Brown, of The Crafty Monkey on Etsy. Susie, Nothing pleases me more than receiving feedback like yours. I’m sure that your crocheted flowers will be beautiful!